We know very little about how humans used animals in urban residential settings, especially in Iowa City, where there are few detailed historic accounts of daily life before the Civil War. What did people eat? Did they raise and butcher their own animals? Are there differences in animal use between different areas of the site and over time? Over the past few weeks, I’ve looked at all the shell and bone that was excavated at Hubbard Park, an historic archaeological site occupied from ca. 1840 until 1926 in Iowa City. While cataloging is being completed, I’ve been researching historic animal use in Iowa City and comparing it with the results from Hubbard Park. Passing references to townsfolk in 19th-century Iowa City keeping livestock abound in county histories; pigs, cattle, horses, mules, sheep, and dogs are all mentioned. Interestingly there are no mentions of domestic duck, chicken, geese, or goats in these histories, all animals that can be easily raised in semi-urban settings, but the archaeological record from Hubbard Park indicates chicken, duck, and ovicaprids (sheep or goat) were common in Iowa City. Nor is there mention of house cats, remains of which were also found at Hubbard Park, suggesting county histories are not the best source for determining the types of fauna present in early Iowa City. Given the abundance of dogs in 19th century agricultural censuses it was surprising that no dog remains were recovered from the Hubbard Park fauna. Presumably dogs were kept as companion animals and their remains were not included with household trash. It is reasonable to assume that horses were kept in some of the larger barns or stables in the center of the block, and old photos show a fenced pasture was just west of the block. The presence of horses is also seen in a stirrup recovered from a pre-Civil War feature and a horseshoe found nearby. No horse remains were recovered, presumably because horse carcasses had value to renderers, and therefore were not disposed of on site. Two domestic cat teeth from different parts of the site in disturbed contexts suggests that cats were feral and not kept as companion animals; their remains were either discarded with general site trash or they were part of the background fauna. Companion cats, if any, would presumably be buried in the same contexts as companion dogs, in features not identified during excavation. Although rabbit was recovered from Hubbard Park, all identifiable remains were of wild cottontail, Sylvilagus floridanus, not domestic breeds. Grey squirrel (Sciurus carolinensis) was also recovered. It was not clear from remains if these small mammals were hunted, trapped, or were incidental background fauna in the site assemblage. There is archaeological evidence for small-game hunters living on the block; a privy contained narrow-gauge ammunition, small shot, and clay pigeons. Duck may have been kept on site, a few elements of Anas platyrhynchos and Anas sp. were recovered from different features, but it was not clear if these were domestic duck or wild mallard duck; their skeletons are very similar and there is evidence for small-game hunting, as discussed above. No geese were recovered, suggesting geese were not kept at Hubbard Park, even though other parts of Iowa City were known for urban geese, such as Goosetown on the north side. Presumably incidental inclusions in archaeological deposits, or the remains of trapped animals, a few rodents and other micromammals were identified at Hubbard Park. These include house mouse (Mus musculus) as well as numerous unidentified micromammal elements recovered from flotation. Wild aquatic resources were presumably available to residents of Hubbard Park, situated along the Iowa River, and included turtle and mussels. However, both turtles and bivalves could be part of the background soils of the floodplain Hubbard Park sits in. There was no evidence of butchering or heating of bivalves or turtles. Several of the bivalves were quite small, less than 3 or 4 cm in diameter, and were unlikely to be used for food, but others were larger. Species identified included pigtoe (Fusconaia flava), threeridge (Amblema plicata), mucket (Actinonaias ligamentina) and Quadrula sp. All could have occurred naturally in the Iowa River floodplain historically. The turtle shell was too fragmentary to identify to species, but many shell segments appeared to come from large specimens. An oyster shell was identified in earlier excavations, and a possible marine shell fragment was identified in Level 1 of Feature 38, indicating some exotic bivalves were introduced to the site, either for consumption or decoration. One shell was apparently carved, perhaps prehistorically, found in a non-feature context in the north east part of the site in the general area where many prehistoric artifacts were found. Possible prehistoric or protohistoric shell pendant or lure. Fish were rare in dry-screened samples, primarily because fish bones are often very small and fragile, and fall through ¼-in mesh. Fish bones and scales were common in soil flotation samples, most flotation samples contained fish remains, and several flotation samples had hundreds of fish bones and scales. Some of the smaller fish specimens may be background fauna in the floodplain soil, larger specimens were likely caught or purchased by residents. The Hubbard Park residents consumed a great deal of chicken, and appear to have butchered chickens on-site, as shown by the ubiquity of feet and several cranial segments. Chicken feet (metatarsi and phalanges) and heads recovered from an 1880s privy, this is evidence of on-site butchering. Both pig and cattle remains were common at Hubbard Park, and they probably provided the bulk meat to the residents of Hubbard Park. Most of the pigs appear to be young, but there are a few older specimens. 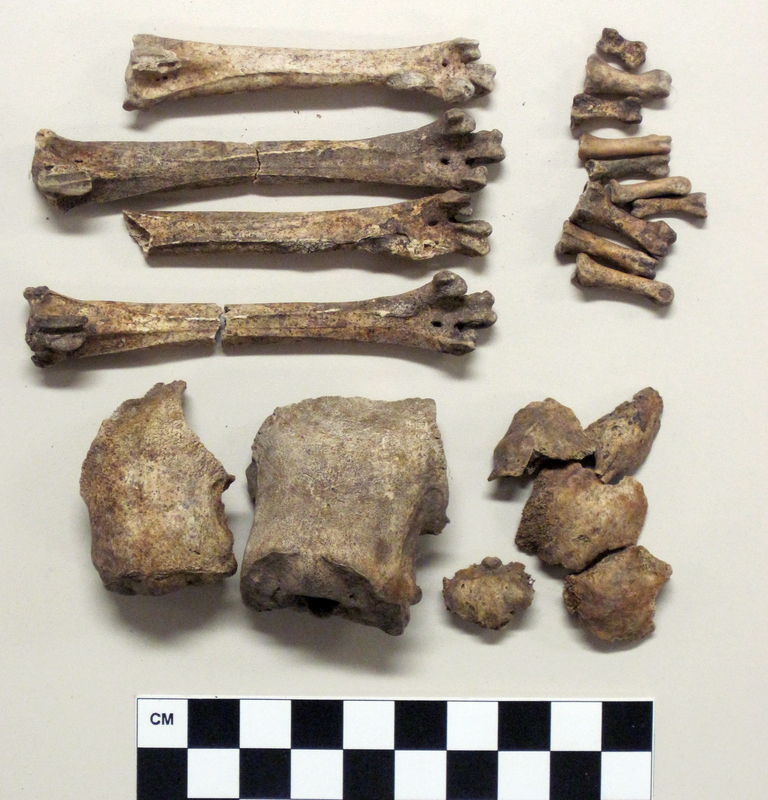 Cattle bones appear to be a mix of young and older mature, suggesting dairy cattle were kept. At this time, there seems to be a mix of commercial butchered scraps and on-site butchered scraps. If true, my next job is to determine if home butchering became less common over time as the block filled in and people no longer were able to pasture. I also want to look at the particular cuts of meat, to see if there are differences in consumption across the block. Cattle maxilla, ca. 2.5–3 years old. The presence of part of the head suggests cattle were butchered on site, and the age of the cow is older than expected if it was just being raised for meat; most pastured cattle are slaughtered for meat before they are 2 years old.